Taking place April 2nd – 4th in Las Vegas, Nevada ISC West is the largest physical security show in North America featuring over 1,000 exhibitors in one place over a 3 day period. ISC West is the security industry’s premier launching pad for new products, solutions and technologies. 26,000 security professionals attend the show to view the 10,000+ products featured on its show floor and attend business critical education sessions on the newest technologies in security. As a media partner for ISC West 2014 HomeToys.com will be bringing all the industry news and exciting new products to our eMagazine to help our readers make sense of the massive event. We have compiled a list of some new product releases from this years show below. As well make sure to check out our special ISC West Newspage for Exhibitor news and announcements. 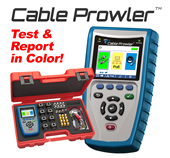 Ideal for the security professional, the Cable Prowler provides full cable testing on any category network, coax, or telephone cable, combining the functions of a high-end cable tester and length measurement tester, with the capability to identify link status, link capability, and PoE detection. The Cable Prowler provides full cable testing, displaying wire map, numbered ID remotes, and any faults, including shorts, opens, miswires, split pairs, and reverses. It also enables quick identification of a network drops link capability and current link status. All of this in full color and internal memory to save results, as well as the ability to export to a computer via micro USB cable for record keeping and printing. The Cable Prowler Kit (TCB300K1) includes the main unit, coax and network remote set (#1-5, F-Conn coupler includes foam holder), network/tel testing and ID remote #1, RJ12 Cable (Qty 2), micro USB cable, protective silicone holster, and a hanging T3 pouch. Made in the USA, the Cable Prowler has an MSRP of $749.95 for the Complete Kit (P/N TCB300K1), and $529.95 for the tester only (P/N TCB300). Leviton’s upping their Z-Wave game by adding CFL/LED support to their most popular dimmer and plug-in modules. This is great news for security systems/hubs/gateways that utilize Z-Wave, as the universal in-wall switch and plug-in modules will become the de facto devices for residential energy management. Security dealers love Leviton’s Vizia RF + Z-Wave devices, because lighting control is always desirable, the products are easy to scale, and the devices are profitable due to low-call backs. Leviton’s new release of the VRMX1 features up to 450W capabilities for CFL and LED, or 1000W for legacy incandescent and halogen. Despite adding this functionality, the pricing of the VRMX1 has been reduced significantly. The VRPD3, Plug-In Dimming Module, can accommodate up to 100W CFL/LED or 300W Incandescent, while the VRPA1, 15A Plug-In Module, could accommodate up to 1800W of Incandescent, or an impressive 5A of CFL/LED. The e3 OneBox™ combines Linear’s award-winning, embedded browser IP-based access control platform with Digital Watchdog’s full-featured DW-VMAX digital video recording capability within one enclosure to create a fully-integrated access and video solution. Integrating access control and video into a single platform has many security and installation benefits. Event-driven video tagging, for instance, allows users to capture and quickly find video of a specific access point at the time it was opened, closed or locked. Video tagging can be useful for verifying the identity of users, catching tail-gaters who may have gained unauthorized access by following someone in, validating shipments, or even tracking people and items coming in and out of a facility. Prescreen your visitors from any monitor in your home! You will love the convenience of the IST 304’s hands-free communication to your door while you are safely inside your home. The IST 304 system supports up to 4 interior monitors – put a monitor in your kitchen, your bedroom, the family room – anywhere you want access to a point of entry without the need to physically be there. Monitors feature a 6” LCD screen with adjustable brightness and contrast, housed in a flattering low-profile white casing that stands only 7/8” inch from the wall and will integrate into any home décor. Do you have multiple points of access to your home? No problem! The IST 304 system can network up to 4 exterior cameras across a span of 400 feet, giving guests hands-free communication to any of your indoor monitors. The sleek, unobtrusive exteriors of the cameras, designed with the luster of stainless steel, include vandalism and rain guards. Door cameras also have LEDs for night vision, and selectable door chimes. The Proficient Protege includes every type of flush mount architectural speaker a system integrator might need for residential installations: 18 ceiling speakers, 10 in-wall speakers, two in-wall subwoofers and a ceiling subwoofer. “The Thin-Bezel design has become popular in the residential custom-installation market and we knew our dealers would love it,” Core Brands’ Keith Marshall said as part of the announcement. “But we didn’t want them to have to get used to new models, especially since they like our signature sound so much already. That’s why we created Protege as an adaptation of our existing speaker line. There’s nothing new for the dealer to learn. The installation procedure is basically the same, and even the model numbers have barely changed." LCD, plasma TV’s and compact-fluorescent lighting (CFL) are now house-hold items—and all are potential sources of interference for any IR system. Equally critical, today’s satellite and CATV set-top boxes need precise, error-free remote control commands in order to function. That’s why Xantech’s new 95 and 85 series IR kits feature three significant advances in IR technology to deliver outstanding sensitivity, performance and reliability in a wide variety of installation environments. In addition, all three Xantech IR series kits feature superior build quality plus advanced circuitry which passes native IR carrier and data signals faithfully and reliably to ensure proper control of all A/V components. Where space is at a premium, getting equipment off the floor and up on the wall is a must when floor standing equipment racks just won’t do. VMP designed the new ERWEN Series wall mounted racks for both form and functionality, especially with the security and AV installer in mind. With adjustable front and rear rails, removable hinged wall plate and a reversible hinged tempered glass front door, the ERWEN-12E and ERWEN-15E are the answer to the most demanding rack mount requirements. Additional specifications include: works with all standard 19-inch rack equipment and accessories; 12 rack spaces (ERWEN-12E); 15 rack spaces (ERWEN-15E); rails threaded with standard 10-32 threading; vented top and bottom; top and bottom cable routing knockouts; removable hinged back panel; lockable, removable side panels (locks optional); welded steel construction; ships assembled; load capacity – 120 lbs. ; black powder coat finish; product dimensions (ERWEN-12E): (W x D x H): 24.3in x 21.9in x 25.3in; product dimensions (ERWEN-15E): (W x D x H): 24.3in x 21.9in x 30.5in. ; product weight: 61.6 lbs (ERWEN-12E); product weight: 71.3 lbs (ERWEN-15E); Now shipping, the ERWEN-12E (12 space) has an MSRP of $379.00, while the ERWEN-15E (15 space) has an MSRP of $419.00. MuxLab Inc. is pleased to announce and present at ISC West its new 3 and 16 slot Rackmount Transceiver Chassis’ which provide a complete racking solution for its IP over Coax structured cabling solutions. The new chassis’ are designed to support the wide variety of MuxLab IP over Coax transmitters and receivers and are standard 19” rack mountable. The Rackmount also comes in a powered version for a simple and easy solution to power up active units. Sentry Security Systems Inc. is pleased to announce the release of the 5 Megapixel Fisheye IP Camera, compatible with the Control4 driver. Providing up to a 360° view, this camera’s low profile and aesthetically pleasing design makes it particularly well suited for use in residential applications with large rooms and high ceilings. Using a Fisheye IP camera, complete coverage can be obtained without having to use multiple cameras which can detract from the aesthetics of the room, often a significant factor in whether the project goes ahead or not. Contact Bill Graham at 866-736-8796 for more information. The ELK-6050 Wireless Smoke Detector is a vital part to the ELK Two-Way Wireless product line. With laws requiring sounders and smoke detectors in every bedroom, in addition to every common point of egress, the ELK-6050 Wireless Smoke Detector provides a two-way wireless solution with signal acknowledgement and built-in sounder. In the event of a fire alarm, whether detected by the ELK-6050 or another source, ELK’s two-way wireless technology allows ELK M1 Controls to activate the built-in sounders of all enrolled smoke detectors during the alarm. The ELK-6050 is powered by long life 3V Lithium batteries and utilizes photoelectric smoke detection technology and includes rapid “rate-of-rise” and fixed temperature detection. The ELK-6050 is designed for use with the ELK-M1XRFTW Two-Way Wireless Transceiver for M1 Controls, in residential and light commercial applications. At 2014 ISC West, IC Realtime unveiled its ground-breaking 720-degree camera technology designed for elite surveillance applications. This special remote-viewing platform is comprised of proprietary software, gyroscopic movement technology and a dual-lens 720-degree camera system. By incorporating many software sensors and synchronizing both front and rear spheres (camera lenses) together, IC Realtime is able to capture 360-degree x 360-degree video to create a 3D-like experience that puts the viewer completely in the center of the action. The technology will make its way to market later this year in a brand-new series of two-lens mega-pixel cameras from IC Realtime called IC720. Different versions of the camera with interchangeable sensors and lenses to achieve a wide variety of video surveillance needs (including a 28-megapixel version) are currently in the works. WaterCop automatic water shutoff systems provide your home or building with round-the-clock indoor flood protection. This constantly expanding product family offers single point shut-off, multi-point whole house leak detection using wired and wireless flood sensors, central control wall switches, informative monitoring stations, instant low voltage compatibility with most home security or home automation systems and Z-Wave protocol capabilities. The model PRX-2 is designed to be mounted directly to standard single-gang wall box, and integrates both a 125KHz proximity card reader and keypad into a single-unit making it ideal for applications requiring an access credential and/or personal identification number (PIN). The proximity card reader and keypad of the PRX-2 both transmit data in 26-Bit Wiegand format, making it compatible with any of the Wiegand equipped Viking entry controllers. Middle Atlantic’s VisionFrame Monitor Wall is a robust video monitor support system application engineered for unparalleled monitor support. Create the combination of monitors you need, in the size you need them and we’ll configure the mounting solution. D-Tools, Inc., the worldwide leader in system integration software will demonstrate its new iOS-based iPad® companion app for its flagship product, SIX 2013 at ISC West April 2-4, 2014 at the Sands Expo in Las Vegas (D-Tools booth #26135). Available for D-Tools partners worldwide, the new release adds mobile quoting capabilities that enable Commercial and Residential AV integrators to generate quotes natively on an iPad, then import them into the full D-Tools SIX 2013 software platform for further project design and management. Delivering on D-Tools’ commitment to streamline product updates and enhancements by consolidating them into an annual release, this new companion app will immediately extend the highly functional D-Tools workflow to mobile sales and specification teams. A native iOS application, the D-Tools Mobile Quote app leverages D-Tools’ extensive manufacturer product library by enabling integrators to access and integrate product category and package data from their SIX 2013 catalog while working with customers in the field. Integrators can enter client and contact information into the iPad app, then walk prospective customers through available installation scenarios in order to create a quote for approval. Once complete, the resulting quote can then be imported into SIX 2013 for additional design work and synchronization. The Mobile Quote app uses many of D-Tools’ workflow concepts, including the specification of locations and systems, which allows integrators to provide packages or pre-configured systems for inclusion in the quote. Labor and general pricing will be calculated to give the customer an accurate proposal, which can then be signed off for approval on the spot. When Sentry360 investigated bringing a 4K camera to market over a year ago it was determined that the impact of the product would be dependent on several key factors. 1. Form factor/Size: Typically when new products are made in this category they start off big and clunky. The IS-DM4K is a 4" x 2" miniature dome which fits in the palm of your hand. 2. Compatibility: New products traditionally have issues working with old or existing systems. The debut of the 4K product line by Sentry360 will come standard with Onvif Profile S protocol allowing configuration, motion detection, multicasting, and most importantly the first Ultra HD camera to have open standards making it compatible with several hundred Onvif conformant video management platforms. 3. Market value/Price: Even if there was an obvious enhancement in image quality the debate would continue on price-per-unit vs. total overall resolution benefit. With the new 4K mini dome, IS-DM4K, Sentry360 has manufactured a compact (easy-to-install), open-architecture, and cost effective camera designed for mass markets of surveillance users. The new Yale Real Living Key Free Touchscreen T1L Deadbolt offers streamlined installation, enhanced security, one-button Z-Wave enrollment, a clean, modern appearance, and it is competitively priced compared to competing electronic deadbolts. The elimination of the cylinder offers homeowners superior security since the lock can't be picked or bumped, and for installers it means that installation is a much smoother process. Regardless of the security or home automation system employed, users have access to a high degree of functionality, including the ability to lock and unlock doors from web-enabled devices or create customized entry scenes for family members, neighbors and guests. The Z-Wave key free deadbolts integrate into a wide range of security and home control systems, including Alarm.com's emPower™, which supports 2GIG, Interlogix and Qolsys systems; Honeywell’s Total Connect; DSC; and the Vera Z-Wave home control system by Mi Casa Verde, among others. The locks will be available from leading industry wholesalers. The iSmartAlarm Smart Switch provides the user complete control over their home’s lighting, appliances, security, and electrical bill. The device provides the ability to expand the iSmartAlarm system to include electrical outlet controls, and users can monitor whether their lighting is on or off, can ensure their dangerous appliances are turned off when not in use, and monitor their energy use in order to save money. Through the same easy-to-use App as their iSmartAlarm Home Security System, the Smart Switch increases home automation and knowledge about the home’s status, allows conditional on-off responses to break-ins, and the ability schedule lighting to give the illusion of people at home.